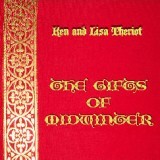 So Tell Us About The Christmas Album, "The Gifts of Midwinter"
We’ve told you that it’s now available, and you’ve seen (and hopefully heard samples of) the songs that are on The Gifts of Midwinter, the new CD by Ken and Lisa Theriot. But other than that you may not know much about it. So we thought publishing the liner notes as a blog post would be a great way to tell everyone about it. Lisa did a great job summarizing the project, as well as printing the lyrics and her translations of the non-English songs. If you’d like to download that as a separate document, you can do that by clicking here: The Gifts of Midwinter Liner Notes. Here is Part 1. We’re going to serialize this due to its length. Since then we have set out to find songs you don’t hear on EVERY Christmas album, though we couldn’t resist putting our stamp on a couple of personal favorites. So here they are, from the sacred to the secular, from medieval to modern. Good Yule and Merry Christmas. Note: all italicized editor’s notes are by me, Lisa Theriot. All translations are my own (I have trust issues!). I once heard a fighter say that he had been really inspired before a battle because the army was singing together in Latin. Horribly, they were singing this song, the chorus of which translates as “Rejoice, for Christ is born of the Virgin Mary!” I’m a little alarmed that they headed off to shed metaphorical blood singing this song, but I suppose it’s quite the medieval attitude. There is no music for the verses in the Piae Cantiones; the verse melody is usually given as from the Bohemian collection referenced above; however, since I have seen at least three different verse melodies all claim the same source, I remain in doubt until the Czech National Library sees fit to web the collection. The original French is far superior to the English translation of “O Holy Night.” The English version fails to capture the emotional transition of the Midnight (Minuit) Mass from awestruck to joyous. The first chorus asks the people to kneel in homage, but the second tells them to stand up and sing for joy at their salvation. People, arise! Sing of your deliverance! Editor’s note: We don’t have permission to post the lyrics here as this song is still under active copyright. © 1962 Jewel Music Publishing Co.